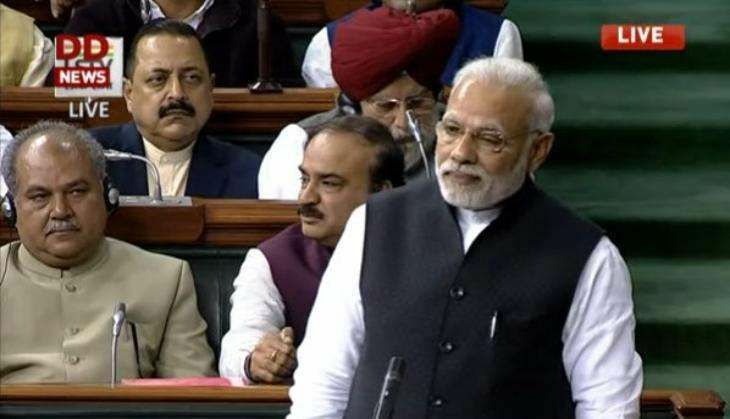 Prime Minister Narendra Modi on 7 February took a jibe at Congress vice-president Rahul Gandhi's 'earthquake' remark that was made in December 2016, saying that the nation finally felt the tremors yesterday. "I was wondering why the earthquake came. When someone see 'SEVA' or any positive virtue in the word 'SCAM' then mother earth would definitely become upset," Prime Minister Modi said while speaking on motion of thanks to President's address in Lok Sabha. Further cornering the Congress Party over the emergency declared during the Indira Gandhi regime, the Prime Minister said: "We remember how democracy was under threat from 1975 to 1977, when opposition leaders were jailed, newspaper freedom curtailed." Emphasising the importance of 'Jan Shakti', the Prime Minister said that it is because of the people's power that a person, born to a poor family became the Prime Minister of India. "Let us understand and appreciate inherent strength of our people and take India to newer heights. Faith in Jan Shakti will give results," he added. - Like Swachh Bharat, the decision on demonetisation is a movement to clean India (from corruption and black money). - When can you have an operation? When body is healthy; Economy was doing well and thus our decision was taken at right time. - We do not see everything through the prism of elections. The interests of the nation are supreme for us. - It does not matter how big you are, you will have to give back what belongs to the poor; My fight is for the poor. - We were ready for discussion, but instead of discussion you (opposition) were more concerned about giving TV bytes. - I was surprised that there were some who made cleanliness also a political issue. Why can't we work together on ushering a Swachh Bharat? - I had said it from the Red Fort that every Prime Minister has contributed to the nation. Polls over. What next for BJP, Congress, Akalis and AAP in Punjab? READ NEXT >> Polls over. What next for BJP, Congress, Akalis and AAP in Punjab?